Nanwai Fangshan Campus is located in the north of Liguang Road and the east of Lize Road in the high-tech park of Jiangning District. The land area is about 187.6 mu. The land for planning is the A33 primary and secondary school land. At present, the construction unit has completed the planning and design, and the total planned construction area of the project is about 162,200 square meters. It is reported that as early as January 2016, Nanfang Fangshan Branch held a signing ceremony for cooperation with the Jiangning District High-tech Park. The school consists of five parts: kindergarten, elementary school, junior high school, science high school, and international high school. 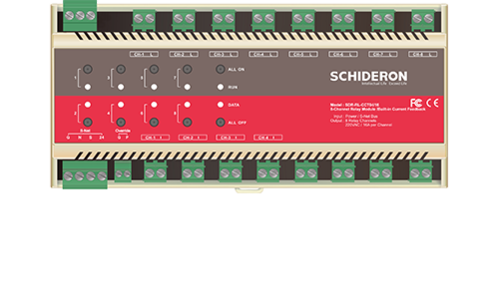 4-way 16A with current monitoring relay switch module (SDR-RL-CCT04/16) is a 4-channel relay control switch device for 120VAC~240VAC pair incandescent, fluorescent, neon/cold cathode tube, etc., 4 independent Input/output isolation channels and four emergency switch buttons allow manual switching of the circuit without bus equipment and software. Each channel is allowed to pass a resistive load current of 16A, or an inductive load current of 8A, and supports electric curtain control and fan control. The device is monitored with load current and each channel data can be uploaded for graphical statistics. Loop independent control, pre-edit scene control and scene timing control can be performed through intelligent lighting management system (LMS). Device data can upload module local data to intelligent lighting management system (LMS) for device status management and data statistical analysis. Transmission and equipment control meet the latest industry industry standards.